To celebrate the end of a successful (yet insanely packed) fall wedding season, it is time to get back to the social scene and invite some friends over for a fun dinner party! 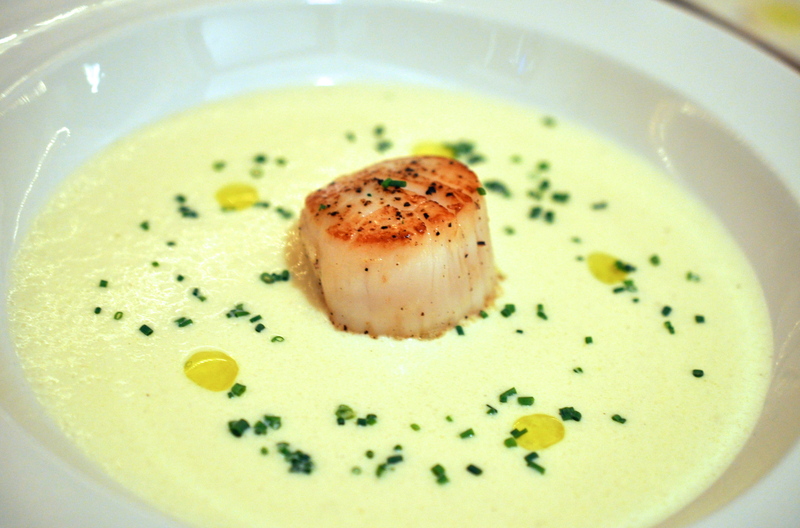 With cauliflower at the tail end of its season, I decided to begin a meal with one of my favorite fall soups – Cream of Cauliflower Soup (with Seared Scallop & Lemon Oil). The freshness of the lemon infused oil brightens up the cream and definitely wakes up your taste buds for the evening. Even better, the soup can be made one day ahead and rewarmed before serving – great for cooks who tend to be stressed out before dinner parties (I’m guilty)! Remember, for your scallops to brown nicely, pat them very dry before searing them. To temper the creaminess (and calories) of the soup, the main course will feature a homey chicken dish from Provence filled with the wonderful aroma of herbs de Provence, juicy tomatoes, kalamata olives, and hearty white onions. I have made this dish with a variety of cuts of chicken, I chose to go with 4 bone in chicken breast this evening for 4 adults. Bringing the meal to a sweet end, I featured my home made Earl Grey Tea ice cream. Delish!! 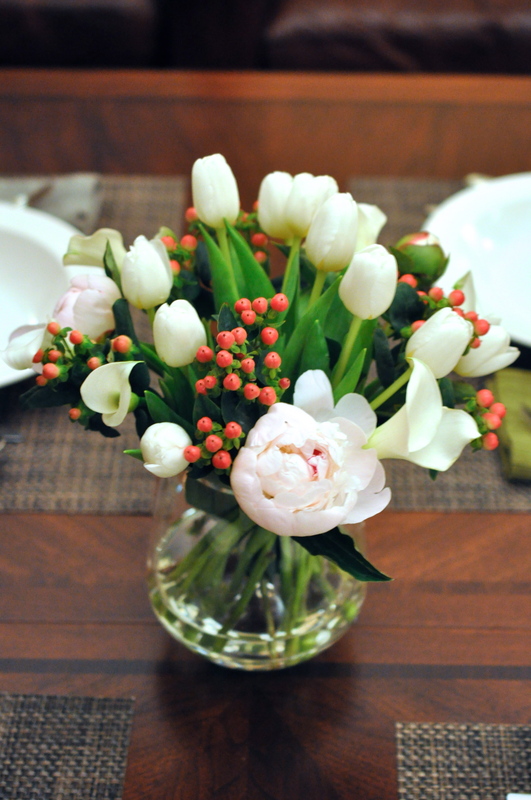 How about an elegant arrangement of Pale Pink Peonies, Chilean Calla Lilies, White Tulips? Add a dash of whimsy (and a nod to the upcoming holiday) with some Hypercium Berries! Heat 2 tablespoons vegetable oil in heavy large saucepan over medium heat (if you want to see if the oil is heated enough, drop a tiny drop of water in there and see if it “dances”. If it does, the oil is ready). Add onion and garlic. Sauté until onion is soft, about 5 minutes. Add cauliflower, broth, and cream. Bring soup to boil. Reduce heat to low, partially cover, and simmer gently until cauliflower is tender, about 18 minutes. Puree soup in small batches in blender until smooth. Return to same saucepan. Season soup with kosher salt and white pepper (go easy on the white pepper, it can easily overpower your soup). After rinsing and patting the Scallops very dry, sprinkle them with salt and pepper. Heat remaining 1 – 2 tablespoon vegetable oil in medium skillet over high heat. Sear until brown and just opaque in center, about 1 1/2 minutes per side (or minute or 2 more if needed to brown). Using a slotted spoon, place 1 or 2 leeks on it at a time and submerge in small saucepan of boiling salted water for about 1 minute to blanch. Set Aside. Ladle soup in a wide rimmed soup / pasta bowl. Place blanched leek in center of each bowl, then place 1 scallop on top of each leek. Use a dropper, surround each scallop with 5 drops of lemon oil, and sprinkle with chives for garnish. Preheat regular oven to 425°F with rack in middle. In a large mixing bowl, toss together tomatoes, onion, olives, sliced garlic, 2 tablespoons oil, 1 teaspoon herbes de Provence, 1/2 teaspoon salt, and 1/4 teaspoon pepper. Stir together 2 teaspoons of minced garlic, 2 teaspoons salt, 1 teaspoon pepper, 2 teaspoons herbes de Provence, and 2 tablespoons olive oil. Rinse chicken and pat dry, then rub inside and out with seasoning mixture. Roast about 1 hour in oven and until skin is golden brown. Make sure center of breast is cooked through! Let chicken stand 10 minutes before serving. 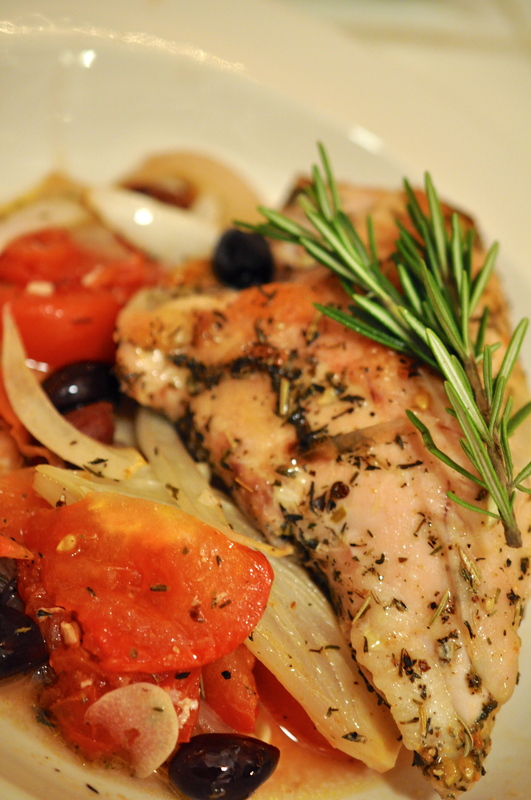 Spoon a layer of vegetables and pan juices onto shallow dish, place chicken breast on top, garnish with a sprig of rosemary and serve immediately. In a medium saucepan mix the milk, cream, granulated sugar, salt. Remove from heat, place tea bags in the pan, cover and steep at room temperature for an hour. Remove tea bags. Re-warm tea infused milk then whisk the egg yolks in a separate bowl and GRADUALLY whisk in about half of the warm milk mixture, stirring constantly. Scrape the warmed yolks back in to the saucepan and cook over low heat, stirring constantly and scraping the bottom with a heatproof spatula, until the mixture thickens and coats the spatula. PATIENCE IS KEY if you don’t want scrambled eggs! Immediately pour the mixture through the strainer into the bowl nested in the ice bath. Mix in the brown sugar, then stir until cool, then chill over night.